Hi friends! 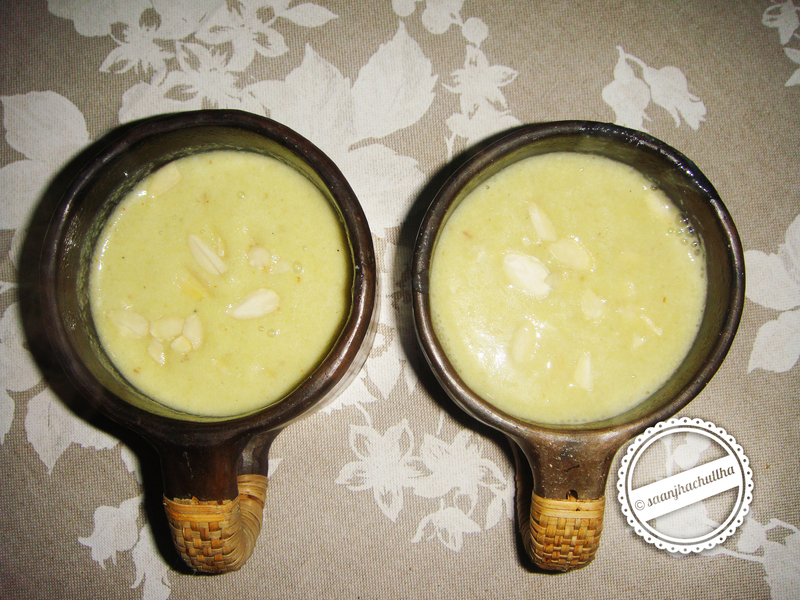 here is a recipe with the goodness of apple and the richness of almonds, which makes this soup extra special for this winter season. Wash the apple, finely chop (approx 1 cup) keep aside. Wash leek well and finely chop, finely chop onion, grind almonds to a paste and keep aside. In a heavy bottom pan heat olive oil over medium heat. Add, finely chopped onion, apple, leek and almond paste. Cook for 2-3minutes. Add three cups of water and boil for 5-8 minutes. Switch off the stove. Cool to room temperature and strain. In a blender take the strained vegetables and add little soup to it and puree. Add the pureed vegetables to the strained liquid and mix well. Add cornflour (dissolve it in two tbsp of water ) simmer for two-three minutes. Serve soup hot garnished with slivered almonds. Both apples and almonds are rich in fiber, so combining these foods makes for a fiber-packed snack. As a result, you’ll likely feel satisfied long after your snack, because the fiber helps fill your stomach and slows digestion to keep you going until your next meal. If you suffer from cardiovascular disease or diabetes, apples and almonds offer additional health benefits by helping control your blood cholesterol and sugar levels. A snack of one large apple and an ounce of almonds contains 8.9 grams of dietary fiber — 42 or 32 percent, respectively, of the recommended fiber intake on a 1,500- or 2,000-calorie diet, according to Colorado State University. Apples contain several nutrients but lack healthy oil; each large apple contains only 0.38 grams of total fat. However, eating fat each day is essential to your well-being, since fats help facilitate hormone production and provide a source of energy. Eating almonds with your apple boosts the snack’s fat content, with each ounce of almonds providing 6 grams of healthy, unsaturated fat. Getting your dietary fat from healthy sources, such as almonds, benefits your cardiovascular system, lowering harmful cholesterol levels and the risk of type 2 diabetes, notes the Linus Pauling Institute. Apples and almonds have complementary vitamin contents. Apples provide a source of vitamin C, or ascorbic acid, while almonds contain vitamin E. Consuming these two vitamins together benefits your health. Normally, your body relies on vitamin E for its antioxidant capabilities, and consuming this nutrient protects your cells from oxidative damage. However, without adequate vitamin C, your body uses up the active vitamin E, leading to an accumulation of an inactive form of the vitamin that no longer protects your cells. Consuming an apple along with almonds ensures that your body has both vitamins E and C to help support continued vitamin E function. If you’re interested in pairing apples and almonds for their health benefits but the thought of eating a whole apple with a handful of almonds sounds dull, get creative. Roughly chop the apple and almonds, then combine them in a bowl with a sprinkle of cinnamon for a raw, apple crisp-like treat. Alternatively, drizzle warm, all-natural almond butter over a thinly sliced apple, or mix almond butter with Greek yogurt to make a healthy dip for apple slices.